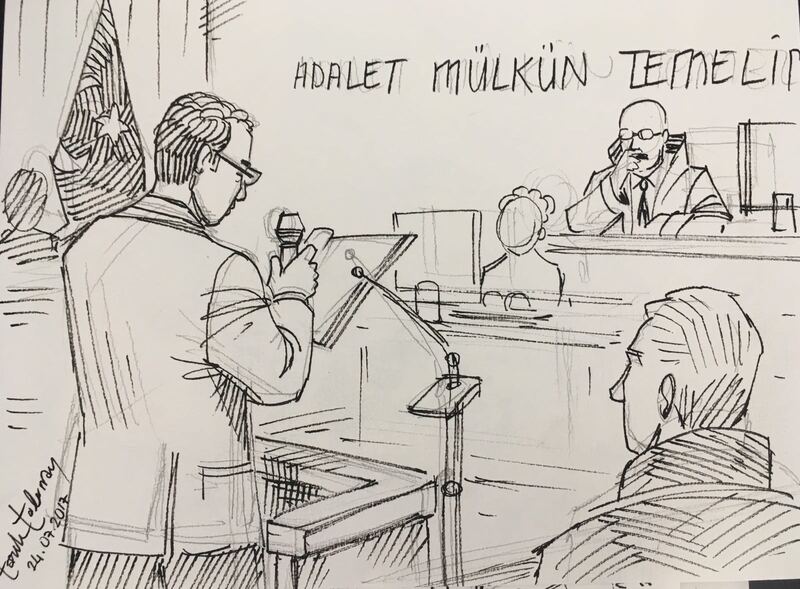 Courtroom sketch by Tarık Tolunay featuring Kadri Gürsel reading his defence statement at the trial against Cumhuriyet Journalists on July 24, 2017. Artist: Tarık Tolunay. Cumhuriyet columnist and IPI Board Member Kadri Gürsel delivering a stirring defence of the rights of journalists on Monday as he stood in court to face sham charges of aiding terrorism. 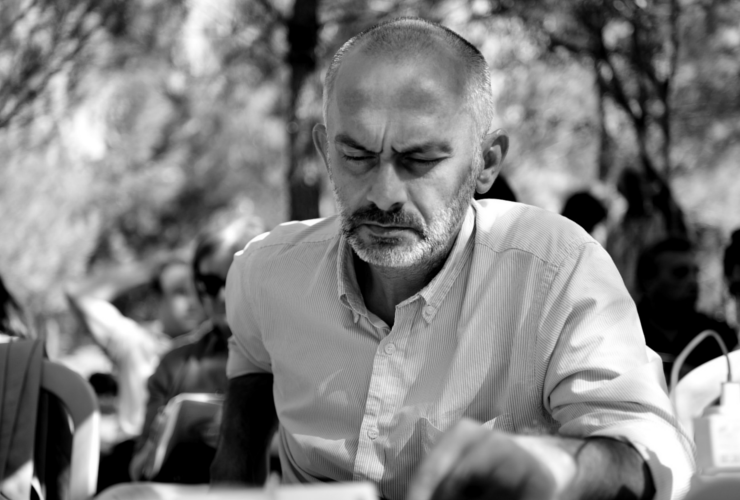 Gürsel, who faces up to 15 years in prison, is one of 17 prominent Cumhuriyet journalists and executives on trial this week in Istanbul’s Çağlayan courthouse. The trial is one of the most significant in Turkey since the country abolished official censorship on July 24, 1908. In his remarks to the court, Gürsel defended the integrity of his work and dismantled the individual accusations against him, which IPI and other groups consider to be politically motivated and brought in retaliation for Gürsel’s criticism of the Turkish government. Gürsel told the court that his foresight regarding Turkey’s growing authoritarianism had been proven correct. Otherwise, he said, “I wouldn’t be on trial today as a criminal of thought, and I wouldn’t have had to wait nine months in prison before having the opportunity to refute all of these baseless, empty and unfounded accusations in front of a court”. Gürsel’s remarks have been translated into English from the original Turkish and substantially condensed for purposes of brevity. In some cases, the remarks are paraphrased for clarity. In the indictment I am charged with “helping an armed terrorist organization while not being a member”. The first specific accusation is that I communicated with 92 suspicious individuals who use ByLock, as well as 21 people who are under investigation for ties to the FETÖ/PDY [ed. : the Turkish government’s name for the movement led by the cleric Fethullah Gülen] armed terror organization. And finally, based on my 12 July 2016 column entitled “Erdoğan wants to be our father,” I am accused of “openly and directly targeting the president’s personality and trying to create a perception that there is an authoritarian regime in Turkey”. Let’s start with the first accusation. The claim that I communicated with 92 ByLock users and 21 other people under investigation for ties to FETÖ/PDY is completely unfounded. The alleged communication with 102 of the 112 people [noted in the indictment] consists of only one-sided SMS messages (85 persons) and/or one-sided telephone calls (17 persons). Since I didn’t answer any of these SMS/calls, it cannot be claimed that I was in communication with these people. On the contrary, we can only speak of their efforts to contact me – efforts that remained unsuccessful. In other words, these people communicated with me, but I did not communicate with them. It shouldn’t be forgotten that journalists are curious people and [in the course of their work] they meet different people. This activity cannot be a crime and cannot be punished in a democracy. This is called journalism, and journalism is not a crime. If the prosecution couldn’t figure out that 95 percent of the claimed communication with 112 ByLock users and FETÖ/PDY suspects consisted of SMS messages that were sent to me once and went unanswered, or were one-sided calls, and as such cannot be evaluated as “communication,” then the prosecution neglected its duty. To make any connection between my position as an editorial consultant [at Cumhuriyet] and the alleged policy change of the newspaper defies logic. First of all, the publishing consultancy, for which I was only able to work for 34 days before I was taken into custody, is not a position from which one can make decisions or changes regarding the policy of the newspaper. The publishing consultant is the person whose opinion is asked if needed. The decision whether to take the consultant’s opinion into consideration or not lies with the management. In any case, how and when could a publishing consultant, who started his job on 27 September 2016 and who could only perform his job for 34 days, make a radical policy change at Cumhuriyet? With regards to the third accusation, in Turkey there is no crime called “openly and directly targeting the president.” On the contrary, a good journalist would openly and directly scrutinize his subject of criticism. Besides, in democracies, there can’t be a law that says the president is excluded from criticism, nor can there be the practice saying that if the president is going to be criticized, it must be done in an implied or indirect way. On top of that, I am a columnist who has been openly warning for years, in every medium, that the [Turkish] regime is becoming more authoritarian. In 2009, I wrote a column for [the newspaper] Milliyet called “We are on our way to an authoritarian regime with elections.”Since then, I have warned in many columns of the regime’s increasingly authoritarian tendencies. Unfortunately, my foresight has become real. Otherwise, I wouldn’t be on trial today as a criminal of thought, and I wouldn’t have had to wait nine months in prison before having the opportunity to refute all of these baseless, empty and unfounded accusations in front of a court. If I am testifying here in front of you as a “defendant,” the reason is that my name was caught up last minute in the political operation to purge Cumhuriyet. The aim of including my name was to shut up and isolate me. The view was that the only way to shut me up just before Turkey was preparing for a constitutional referendum was to arrest me. The reason that I am here in front of you is not because I “helped a terror organization while not being a member.” It’s because I was an independent, critical, questioning journalist and because I have never compromised my work as a journalist and always insisted on doing my job correctly. I was punished in advance by a long period of pre-trial detention because I succeeded in remaining a journalist, despite all of the government’s oppression and threats.